It’s that outside time of year. Which means that we humans must do battle with public enemy number one. That’s right; the mighty mosquito. This easy homemade mosquito repellent really works, and it’s natural, too! Prepping for a work day in Waipi‘o Valley, we were warned about the mosquito population and strongly encouraged to bring mosquito repellent. While I know the commercial bug repellents work, I’m not exactly a fan of rubbing DEET and other chemicals on my skin. So I did what any self-respecting do-it-yourselfer would do: I made my own natural mosquito repellent. It was risky, taking an unproven natural mosquito repellent right into mosquito central. But guess what? It worked. And it worked beautifully. Even people who frequent the valley and do battle with mosquitoes on a regular basis were raving about my homemade mosquito repellent. I’ve made my own natural mosquito repellent before with limited success. 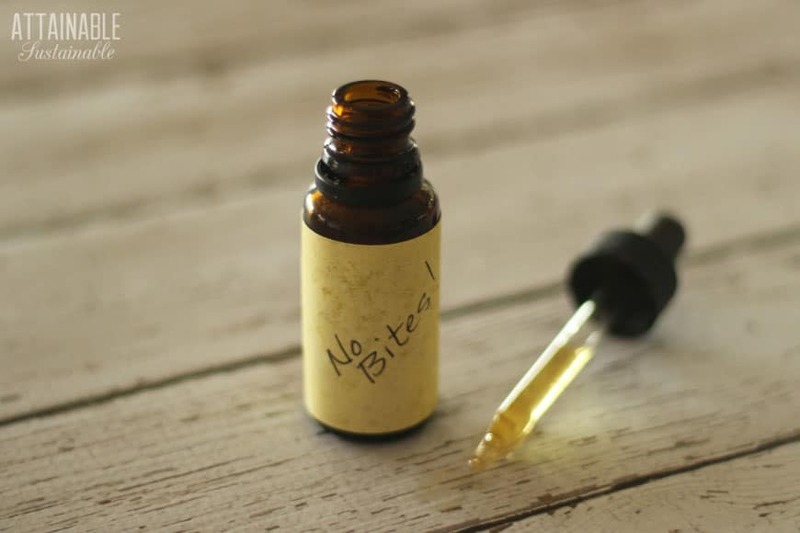 Those of us who used this homemade mosquito repellent came home with few — if any — bites. This homemade mosquito repellent works in Hawaii's jungle -- surely it will keep the bugs at bay at your place, too! If necessary, melt coconut oil. Mix together all ingredients and store in a small jar with an eye dropper top. To use, rub sparingly onto exposed skin. You should not use neem seed oil if you are pregnant or trying to get pregnant, as it is an abortifacient. Heading into the jungle is one thing. But if I can help it, I like to avoid using this homemade mosquito repellent while I’m at home in my own yard even though it’s easy to make. I don’t need one more thing to remember before I head out into the garden! A female mosquito only lives for a couple of weeks, but she can lay thousands of eggs in that time period. And those mosquito eggs can hatch within 24-48 hours! Your goal is to hinder her ability lay eggs, thus breaking the mosquito life cycle. The first step in mosquito control for your yard is to eliminate standing water. Even small amounts of water can be a breeding ground for them. Plants that hold water, such as bromeliads, are also problematic. I’ve opted to avoid these pretty plants because with our year-round rain, the plants are constantly full of water. 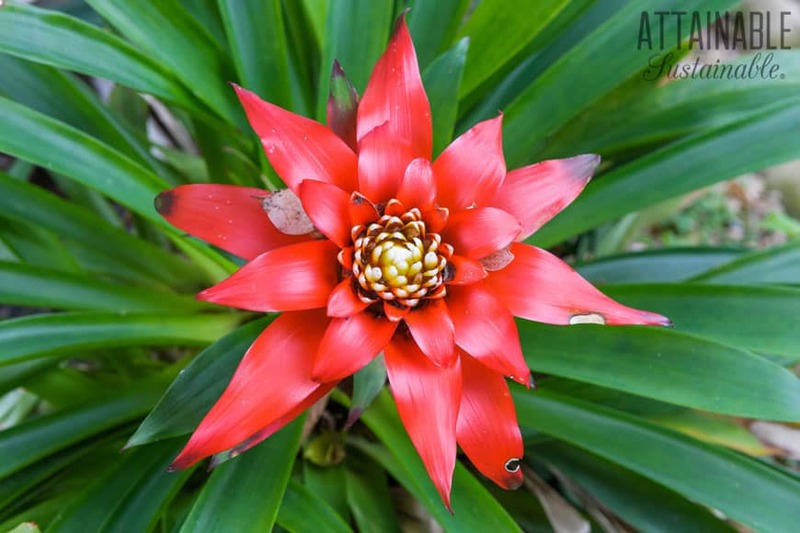 If you live in a drier area but want to grow bromeliads, be sure to water them at their base, rather than overhead to avoid filling the cupped plants with water. Despite their creepy depiction in movies, bats are great to have around! They consume massive numbers of mosquitoes every night and are completely harmless. You can encourage them by hanging a bat house. Mosquitoes can lay eggs in the tiniest amount of water. Overgrown grass and wild areas can harbor them. Keeping the grass mowed and plants pruned to allow a little bit of airflow will help. 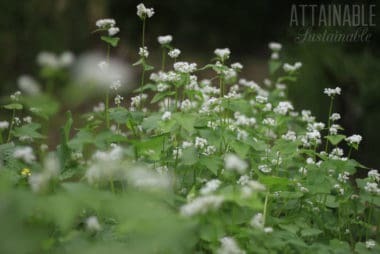 A single fragrant plant won’t keep mosquitoes at bay, but a yard filled with a riot of herbs and other mosquito repelling plants coupled with the tactics outlined above can make a difference. The good news is, many of these plants are good to have in your yard for other reasons, too. thank you thank you thank you!! I needed something for my son this weekend for his backpacking trip! this will be awesome!!!! 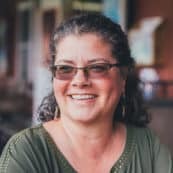 Just wondering if you have a resource on Organic oils to purchase? Plant Therapy oils are (mostly) organic: http://amzn.to/1SN59K2. My daughter is allergic to coconut and coconut oil. Do you have a recommendation for another successful carrier oil? OH, I think you could very easily substitute olive oil for the coconut oil. Shouldn’t impact the bug repelling properties at all. Try soybean oil. It’s supposed to have insect repelling properties. I didn’t know that. I wonder if you can get non-GMO soybean oil? Tea tree oil is another strong smell – good to know that worked for you. i use the citronella in witch hazel and spray it on- you don’t need the oils- though Neem is a good repellent , too 🙂 i want to try this one and put it in a roller bottle ! What is the amount for both? Witch hazel & citronella. I love the simplicity of this recipe. The mosquitoes have been really bad in our backyard, so I’ll be making this ASAP for my family. Thank you. I’ve been having short term luck with lavender and peppermint eo mixed with water in a spray bottle. My dogs have even cone to accept being sprayed because they notice results. Please be careful using EOs with K-9s and felines. Check with your vet or poison control. Thanks!! Trying This Asap. Any Suggestions On A Repellent For The Yard? Whether It’s Something You Burn Like A Candle Or Torch Or A Natural Alternative To Spray? 32 oz mint mouth wash. Mix and spray. Not harmful to plants or animals, but mosquitoes don’t like it. I’d really like to try this. (I have a homemade concoction I make with vanilla extract, but it does require multiple applications. It smells wonderful though! :)) Do you need to apply this repellent to all exposed skin or just dab areas like you would cologne or perfume? Typically all exposed skin needs an application, but with it being an essential oil I wasn’t sure if it’s potency made that not necessary. should another oil/ingredient be used in place of neem seed oil for pregnant women, or is it as effective w/o it? You could substitute another oil, but I think it will end up being lots less effective. I’ve done a basic citronella/oil repellent in the past and while it worked, not *nearly so well as this stuff did. 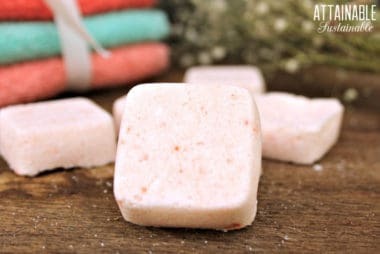 I’ve used Sandalwood oil or sandalwood soap as a bug repellent and it has been the best thing we’ve tried. Works incredibly well and smells great. Do you use the Sandalwood in combination with anything else? How did you apply it? Sandlewood EO is so expensive!! Good that it works, however. Does the neem oil make it unbearable to smell? I use neem & coconut oil before bed ….and I know it’s potent….. I don’t think so! The neem oil I’m using is made locally and I think a cosmetic grade. (?) I don’t find it overly strong at all — just nice and earthy. Neem oil would repel anything, I think. I have used it in the past when my child came home with lice that she caught in school. I used the traditional shampoos….it seemed to make it worse. So I did some research and found out that lice were rampant in India and they would use neem oil. I put together my own recipe which was very similar to this one. The smell was horrible. But effective. Oh, you’ll have to report back! This is a very limited repellent. We use Shoo bug spray from alma naturals. It has many essential oils to repel many types of bugs. And the spray is easy and safe. Note: Neem can also be very dangerous to cats, so if you have felines make sure you don’t put this on and go snuggle them. I just bought neem oil at Whole foods and it smells so bad! I’m afraid to use this much in a recipe. Does anyone have a problem with theirs smelling really bad? It smells “earthy” to me, but not bad. Topical use of small amounts Neem oil will not cause a miscarriage. It has caused reversible sterility in rats when orally consumed in high doses because it has spermicidal qualities. In baboons, it took 6ml of oil, taken 6 days in a row, to cause an abortion. But there is no research to support that external use would have any effect on fetuses or breastfeeding women. Especially in small amounts, such as would be used in this recipe, there is zero cause for concern. When non-medical people make such inaccurate statements it is really frustrating. My wife sees things like this and freaks out until I can calm her down and give her accurate info. Please stop spreading misinformation. My intention was not to spread misinformation. The neem oil I use comes with that warning; I feel as though I’d be remiss in not passing that along. I can’t handle Neem oil. But I was thinking of spraying it on some outdoor plants to discourage insects. i use a mix of coconut and peppermint oil. Peppermint oil is easier to find near me and it works well. One substitute if anyone is allergic is Tea Tree oil. Nice to see other readers knowing thier stuff. I do understand though why she provided the warning. If she hadn’t, there would have been 50 comments screaming at her for not. I look forward to trying this one. FYI that “neem smell” is one of the reason’s I believe this just might work. I am highly allergic to mosquito bites, and I’m also extremly prone to being bitten. So I try natural mixes, from time to time. I hate being the 35 year old “poster child” of DEET use. But it seems to sadly be the only thing that works on *me*. But I plan to keep searching. My family still benifits, bc they’re the ones that end up with my failed blends and they all seem to work to some degree on them. 😉 Thank you for posting this. Can you make neem oil from neem powder? If so how? Essential oils must come from the fresh product (leaf, flower, etc). Once dried, all of the oils present in the fresh product have been dried out. So, no, you can’t make an essential oil from any dried product. You could make either an infusion (like tea) or a decoction (dried material, water, heat let sit then strain) from the dried material, it just wouldn’t be nearly as potent. This looks wonderful and I have already made up a batch for my family. But, do you have any recommendations for biting black fly repellant? We just moved to Maine and are being swarmed. I don’t! I wouldn’t hesitate to see if this helps, though. For Black Flies, we use Z’off by Mountain Martha (in the Adirondack Mountains in NY State). I swear by it. It is essential oils, etc. It’s a strong smell, but not obnoxious esp. when the flies stay away. Saturday while gardening I noticed the black flies were out. They were not biting yet but will be soon. Our worst time is between Mothers’ Day and Fathers’ Day. Good luck. I use witch hazel, vodka, and grape seed oil because straight oil can be hard to spray, and essential oils dont mix with water. they need an emulsifier like the vodka. 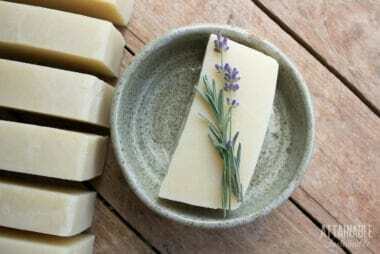 Plus, with the witch hazel and vodka, it helps it to dry quickly and not leave your skin feeling greasy. 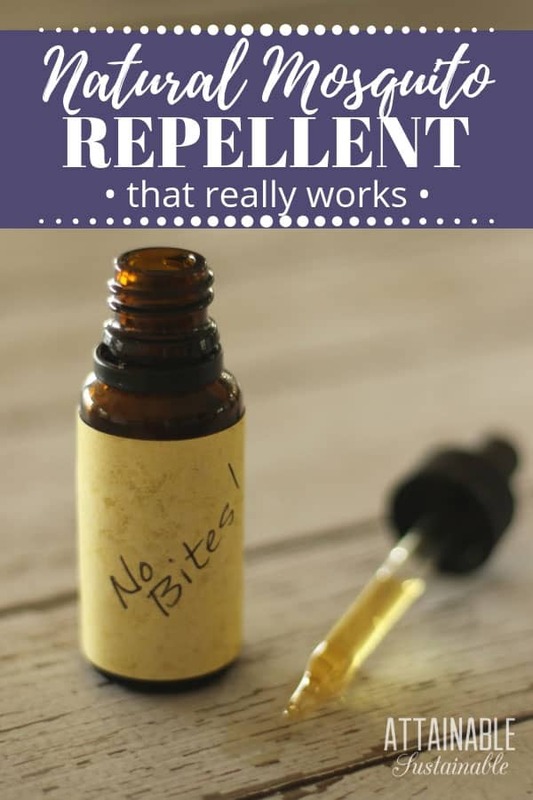 I mix in Rose Geranium for repelling ticks, Catnip essential oil because it has been proven to be WAY more effective than DEET at repelling mosquitos, Citronella essential oil, and Lemon Eucalyptus essential oil. Danielle, your recipe sounds really good. What amount of each oil do you use? Nice recipe, Danielle. I will use this one. We prefer to make our own horse fly spray. Does anyone know if this would be safe to use on horses as a spray or not? Or have any suggestions what we could use instead of Neem oil? We have tried geranium, tea tree, orange, lemon, peppermint, spearmint, eucalyptus, rosemary, clove, vanilla extract, etc. Have not come up with a winning combination but we need it to combat not just mosquitos but all biting bugs. My daughter’s horse is very sensitive to a lot of the commercial products out there. The only fly spray we found to work was an all natural one and the local tractor supply quit carrying it. SO this would be great to know. If neem oil would work we would give this a try. I can’t give you a thumbs up on that; I just don’t know. Maybe someone else will chime in? And I’ll ask over on the Facebook page! Often when things have been discontinued, I try to locate it online and find the ingredients. You wouldn’t necessarily know the ratios, but knowing what is in it is more than half the battle. Just experiment with ratios, knowing that the list of ingredients lists them mostly in order of amounts used. Aside from the neem oil, I use a mixture like this one for my family (except my husband uses OFF while he walks at night, just in case). My home recipe for repellent consists of coconut, cedarwood, peppermint, and citronella oils. It works well for my bub with sensitive skin, and I do like to add the cedarwood for scent. I will definitely share this around because it is a great and simple recipe. I am curious about the neem oil; I wonder how much more effective mine would be with that addition. Sorry – I missed this! You know, I can’t say. I’d ask your veterinarian. I know I’ve heard that essential oils aren’t good for cats. Tried this last year, did not work well at all, I live in NC. Where do you get the Citronella oil in concentrate? Thanks. Lars. There’s a link in the ingredients list. I plan on giving this a chance I am tired of these bug whelps!!! I thought I would get away with just having citronella plant on my porch but they seem to be immune to it here. If you have koi, be sure to wash your hands thoroughly before feeding the fish or putting your hands in the water. I lost all my koi last summer – all at once – and the only thing I can think of is that there was a tiny amount of spray drift of neem oil from my rose spraying (even though I’m awfully careful about that). Neem oil is generally very safe, but koi and tilapia are sensitive to it. I will definitely try this potion this summer, though I’ve found a sprig of lavender rubbed on my exposed skin usually works. Caution with yard sprays! There are some on the market that are natural, organic, safe for mammals birds and fish, but are broad-spectrum pesticides with a fairly long residual (3-4 weeks). These block an invertebrate’s neurotransmitter causing a breakdown of the central nervous system and death. 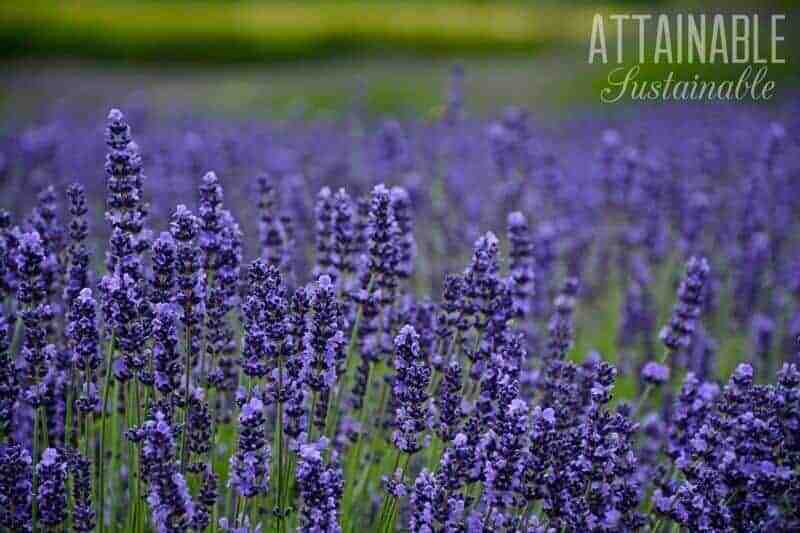 Made of highly concentrated oils of plants like rosemary, thyme, and others, the will kill bees, flies & wasps (including the tiny ones that are beneficial), caterpillars, butterflies, beetles, spiders, as well as mosquitoes and ticks. The labels are, in my opinion, somewhat misleading to the consumer. Before purchasing, or contracting with an applicator, do your research and/or ask about the effects on non-target organisms. Many stores and applicators are playing upon our fear of insect-borne diseases to push these products.